Speak Schmeak: Two-time Academy Award winner needs an acting coach? Two-time Academy Award winner needs an acting coach? 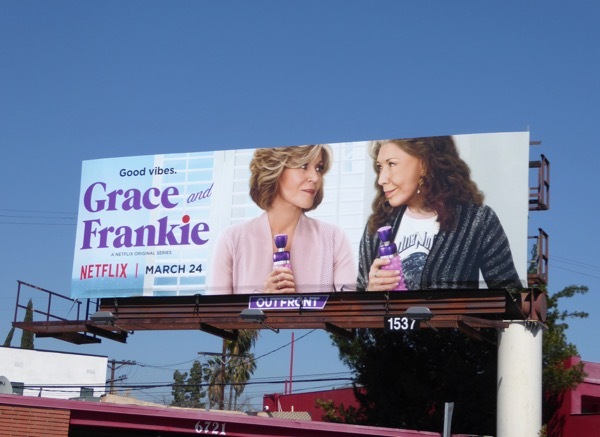 Are you a fan of "Grace and Frankie," the hot Netflix series starring Jane Fonda and Lily Tomlin? My husband and I arrived late to the party, but are now all caught up and attempting to savor season 3 instead of bingeing, like some of my friends have done. If you don't know the show, it's about two women in their seventies whose lives are turned upside down when their husbands divorce them to marry each other. The premise is unusual, and the story is at times hilarious and at other times quite touching and emotional. You might think that someone like Jane Fonda who, at 78, has been in the movie industry longer than many of us have been alive (not to mention her movie-star family members), would feel completely comfortable in her skin and with her abilities at this point in her career. Not so! After the first season, she hired an acting coach. In an interview with Netflix, she said "I’ve never done episodic television before." "I got an acting coach, that’s the extent to which I was insecure, and I sat down with her and we watched every episode together. And then we began working. And that was a revelation." She felt that she was getting rusty. "I also didn’t think I was very good, and I’m a big believer that you can always do better. And just because you’re 78 years old, and you’ve won some awards, doesn’t mean that you’ve got a lock on it." "An acting coach worked with me and helped me understand my character better." I like to remind my audiences (and myself!) that just because you have a lot of experience speaking, or just because you love speaking and have no anxiety, that doesn't mean you're doing it as well as you could be. Are you impacting your audience the way you want to? Are you leaving them feeling motivated and ready to take action? Are you getting all the results you want? If Jane Fonda, two-time Academy Award winner (and three-time Golden Globe winner) uses a coach; if Usain Bolt, eight-time Olympic gold medalist, uses a coach; if Misty Copeland, American Ballet Theater's principal dancer, still goes to ballet class every morning before seven hours of rehearsal—why do we think, as average Joes in the speaking world, that we don't need to keep training, learning and growing? I work with several coaches; I've been with my business coach for five years. At other times, I've hired a coach or joined a program for the short term if there was something specific I wanted to work on. In the past several years, I've had coaches for the virtual parts of my business, for my retreats, for my YouTube presence (still working on that one!) and to express my core message better. I also attend my industry's conferences and mastermind sessions several times a year to stay fresh on my speaking and training skills. What are you doing to keep your skills fresh, your content current, and your message up-to-date? If the answer is "not much" or "nothing," please consider joining me for my upcoming program Speak to Engage Mentoring and Mastery.